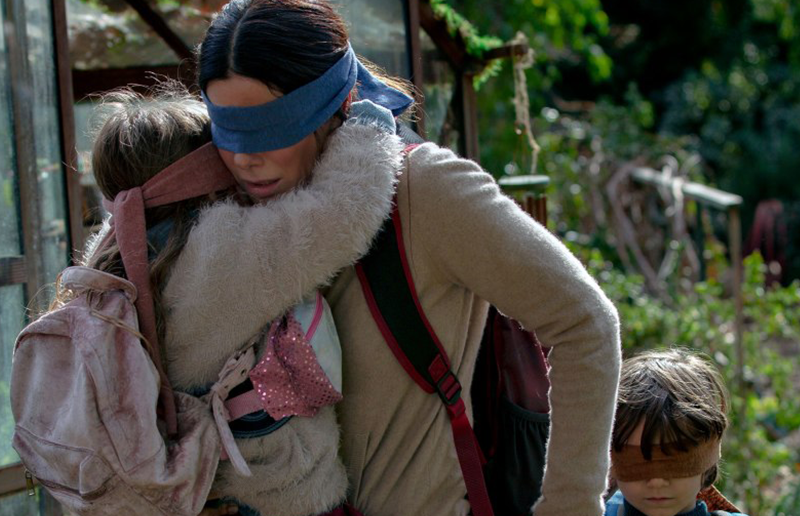 Following the trends of movies that take place in worlds where humans are deprived of bodily functions such as speech or hearing, the movie “Bird Box” introduces a world where people are not allowed to see due to a suicidal spell. Unlike the other movies in which the antagonist is revealed, this film never unveils the true identity of the mysterious creature responsible for casting the spell. 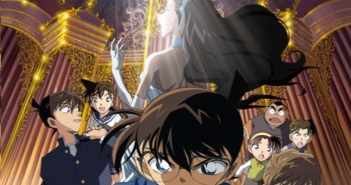 The movie continuously alters scenes between the end and the beginning of the film, a tactic that keeps the audience intrigued. Tensions are built in the start with the main character, Malorie, stressing the importance of not taking off the blindfolds to two young children on a boat. The scene then switches back to the beginning to when Malorie was pregnant. However, Malorie turns emotionally unstable as she suffers through the loss of her sister and the unintended murder of a woman who tried to help her. She seeks refuge in a house with numerous other survivors. After sharing their own experiences, they all conclude that seeing the monster invokes suicidal behavior. As provisions are decreasing, some decide to leave the refuge house to a nearby convenience store. There, Malorie comes across a flock of birds in a cage that seemingly are able to detect the monster without being affected. However, soon, the serenity of the house is broken by the admittance of a mentally unstable man named Gary. Unlike other horror films, the invisible monster is intelligent and is able to easily manipulate people. By finding the deepest secrets and weakest points of people, it can eventually provoke them to take off their blindfolds. For example, when Jess looks at the monster, she calls out for her mother, indicating that she may have envisioned her mother telling her to take a look at the monster. Also, the monster is capable of maneuvering mentally unstable people to help forcefully take the blindfold off of people’s faces or convince them that the sighting is remarkable and is worth a glance. The monsters are clever enough to take advantage of the mentally unstable people by turning them homicidal instead. Gary, for example, pries open other survivor’s eyes so that one would be forced to look at the monster. As Gary kills every survivor in the house, the only survivors left are Malorie, Tom, and the two newborn children. Seeking for more provisions, Malorie and Tom exchange turns to venture out and find better shelters and supplies. Tom reaches contact with other survivors and eventually finds out that there is one shelter available near the end of the river. Before they arrive at the river to head to the shelter, they encounter homicidal people, who Tom manages to kill before he gets attacked by the monster. Without Tom, Malorie takes a risk of trusting the radio signal and heads toward the rapid rivers with the two kids try to manage to arrive at the community, which may or may not offer sanctuary. 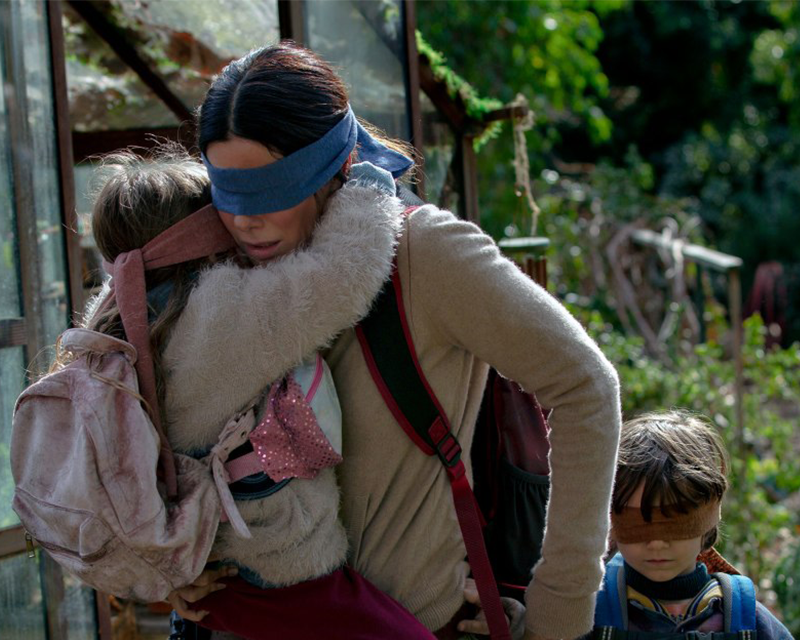 Having made minor changes from the original novel, “Bird box” received fairly positive reviews; in fact, some key differences gave fans of the novel several pleasant surprises. First, the book’s setting is in Detroit, while the movie’s setting is in California. Second, Tom is given the role of Malorie’s lover and a father figure to the children after they are born, whereas in the book he is not Malorie’s lover but the leader of the group of survivors and dies before the children are even born. Third, unlike the movie in which the children can occasionally take off their blindfolds, the book depicts the kids are forbidden from taking off their blindfolds from birth, which helps them naturally strengthen their other four senses. Lastly, the movie ends differently than the book, which many book lovers have been disappointed by since the ending is subdued to be less gruesome than the scenes in the novel. In addition to the suspense, the movie shows the development of Malorie throughout, as she becomes a more loving and caring individual. In the beginning of the film, Malorie is seen as uncaring and neglectful of her children –as her son is born, and her fellow survivor also gives birth to a girl, Malorie simply names them “boy” and “girl.” However, Malorie eventually replaces feelings of indifference with love. When Malorie is told that she has to sacrifice one person by the time she and her children reach the rapids, she refuses to sacrifice anyone because she learns to love both the boy and girl, despite having despised the girl initially for not being her own daughter. Hence, the film not only contains horror scenes, but also consists of emotional elements, especially as Malorie voices her love and concern for the little girl who at first felt that she was not loved. “Actually, your name is Olympia, named after the sweetest girl I ever met and you name is Tom, and I am your mother,” said Malorie. 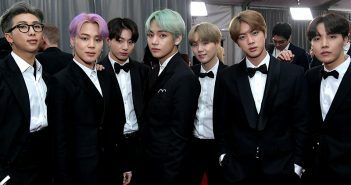 Becoming the most watched movie on Netflix with over 45 million views only by the first week of the release, the movie has been successful and is worth a watch. Lauren Kang is a junior and a photographer for Tiger Times. She enjoys playing volleyball and chatting with her friends in her free time. She hates bugs, so approach her with a bug!